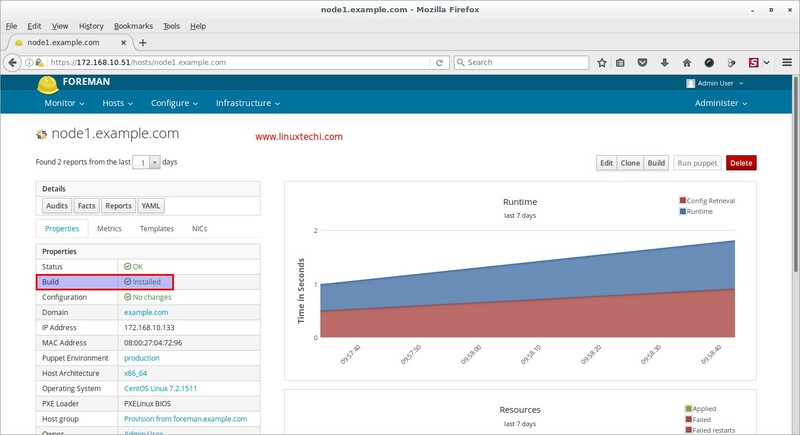 Foreman is a free and open source tool that can provision bare metal and create virtual machine instances under public and provide cloud. Apart from the provision it is also used for configuring your system using puppet, it can perform perform all the repetitive task automatically using Puppet, chef, Salt and Ansible. 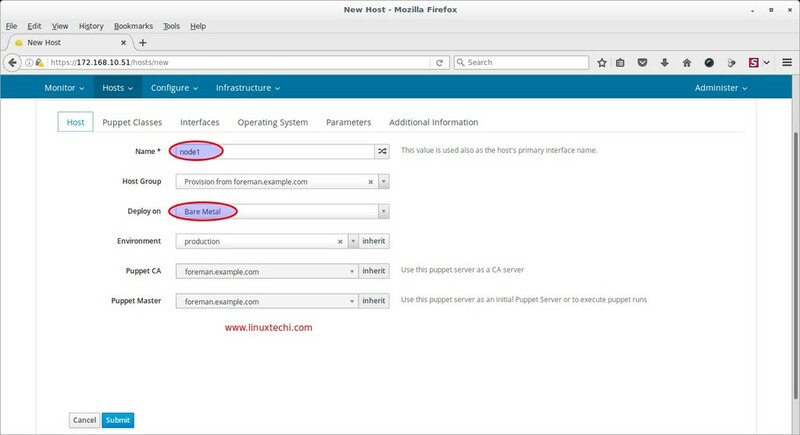 Though Puppet is the default configuration tool that is being installed when we install Foreman server. 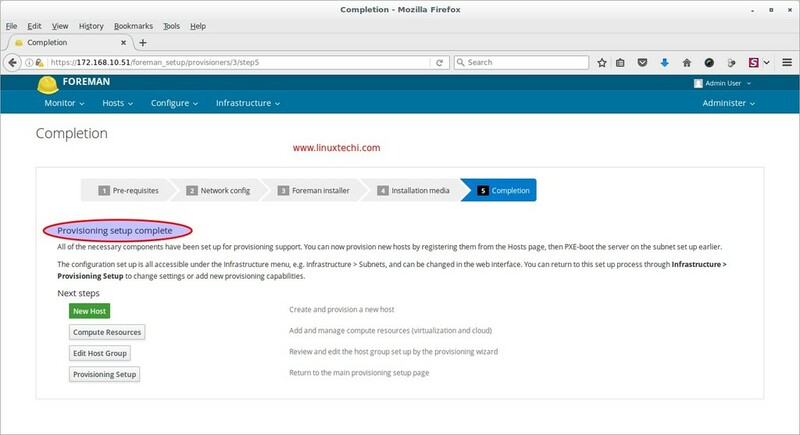 In this article we will walk through the steps how bare metal and virtual machines are provisioned through foreman server. I am assuming foreman server is already installed on CentOS 7 / RHEL 7. 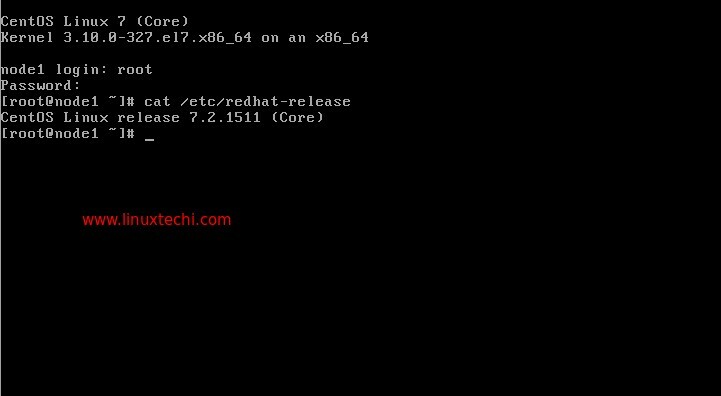 Let’s assume we want to install CentOS 7 as a operating system on bare metal servers or in virtual machines. For that first we need to create installation media from Foreman Dashboard. 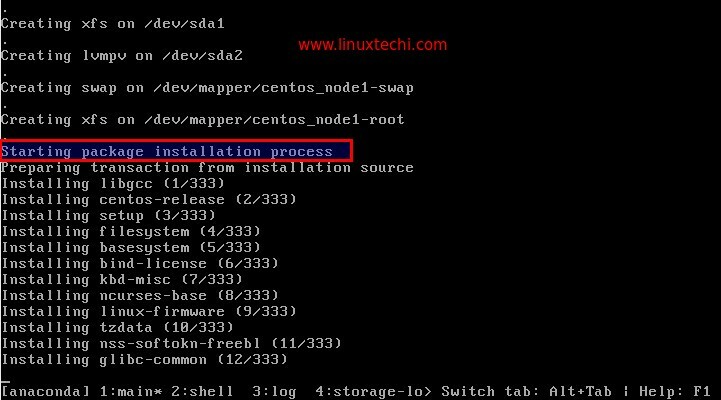 Before creating installation media let’s share the contents of CentOS 7 ISO file via ftp. In my case i have already install ftp (vsftpd) on foreman server itself and copy the contents of CentOS 7 ISO file in “/var/ftp/pub/CentOS_7_x86_64“. Click on Submit, We will come back here again once we define the templates for the newly created Operating system and then we will associate these templates from templates Tab. 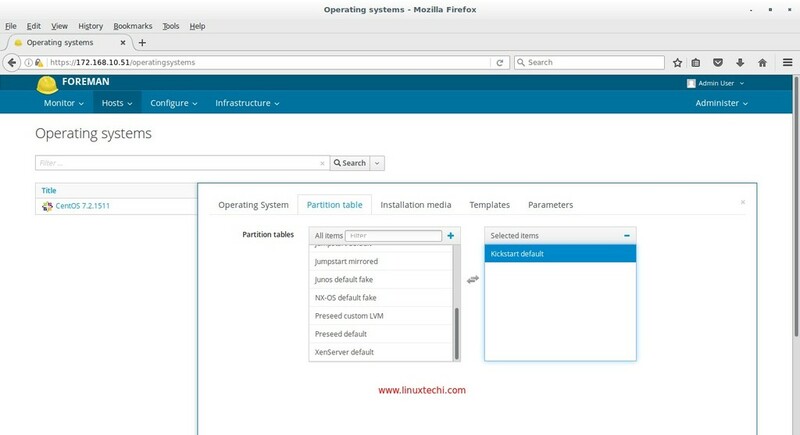 To define the Templates for the Operating system , Go to Hosts Tab –> Select Provisioning Templates . 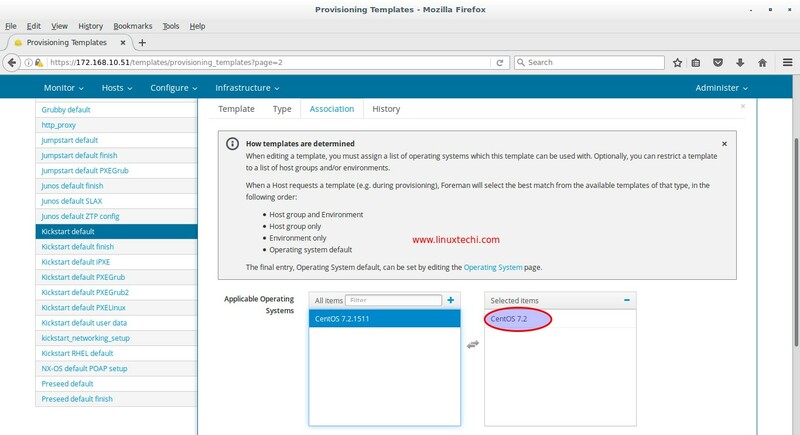 We will define 5 templates for our Operating system “CentOS 7.2“, These are highlighted in below screen. Next Screen will appear and will look like below. 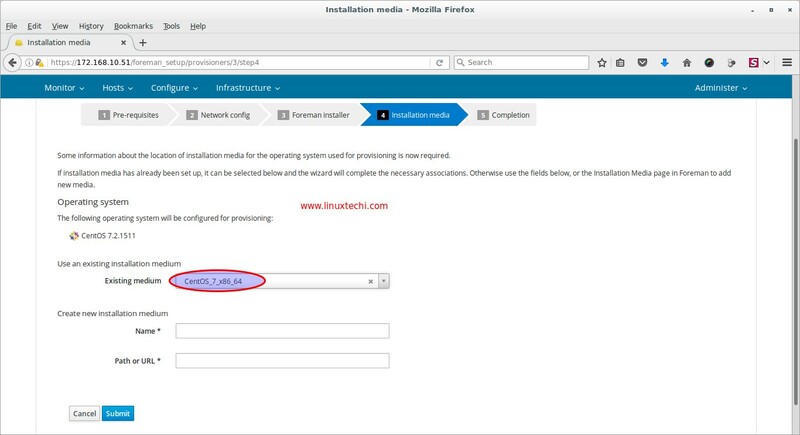 From “Installation Media” Tab select the installation medium (CentOS_7_x86_64) that we have created in above steps. As we can see Provisioning Setup is completed. Our next task is to create the Host . Step:4 (optional) Edit Provisioning Template kickstart Default. 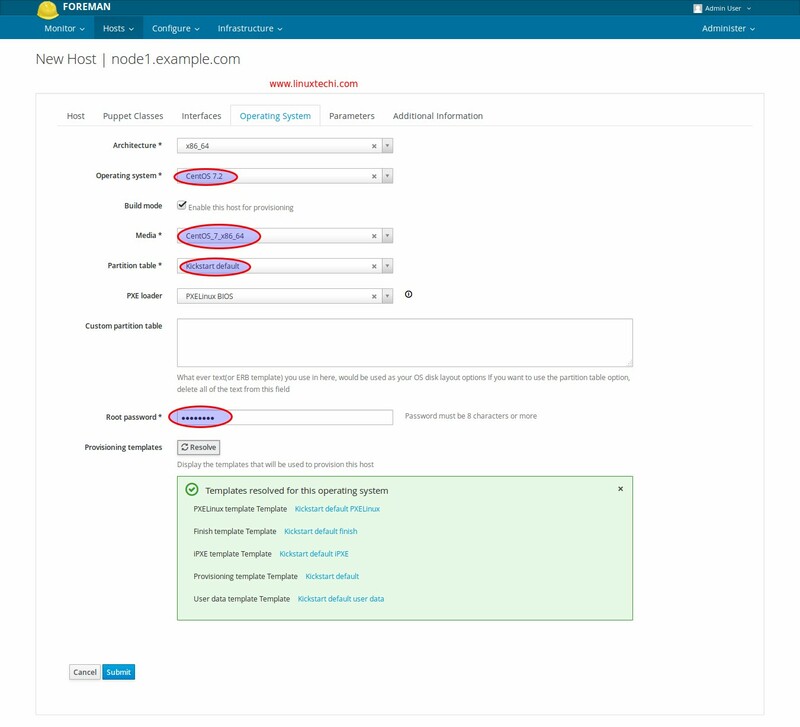 From this template file also remove epel-release package from the package list.Once you are done with these two changes , click on submit to save these changes. From the Hosts Tab –> Select New Host, Specify the name, Host Group and other required parameters. Define the interface parameters and its values from Interface Tab. 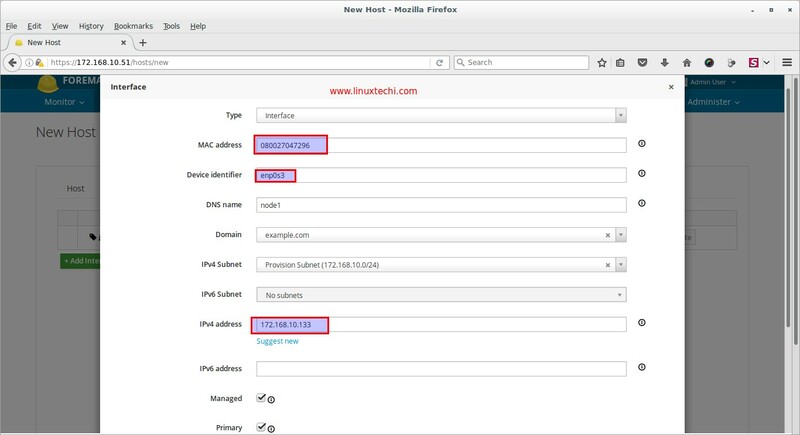 Specify the MAC address of interface of your server which you want to provision through foreman. 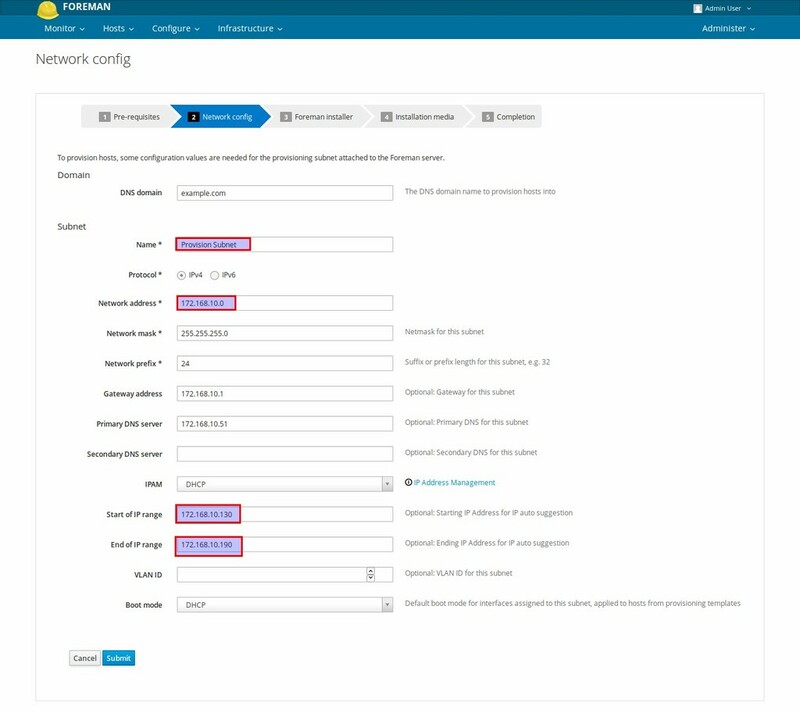 Interface name as ‘enp0s3‘ and IP address will be picked automatically from the provision subnet. 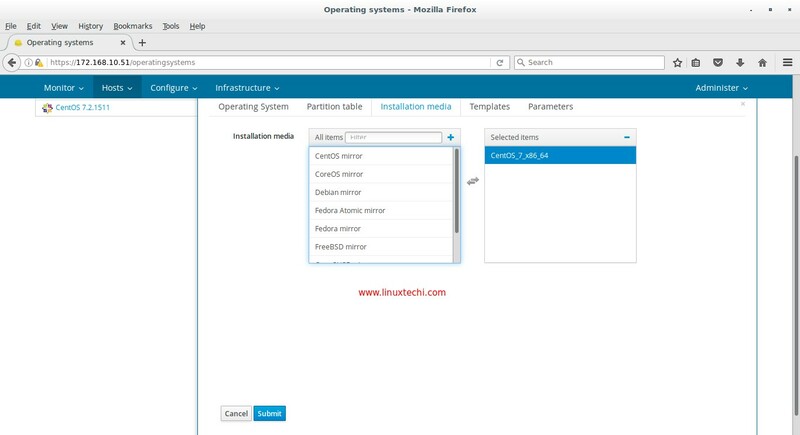 Once you are done with settings then click on OK.
Go to the Operating system Tab, Select the Operating system “CentOS 7.2” , Media as “CentOS_7_x86_64” and Kickstart default as Partition Table and Root password that you want to set. Step:6 Boot Your Server or virtual Machine via PXE. 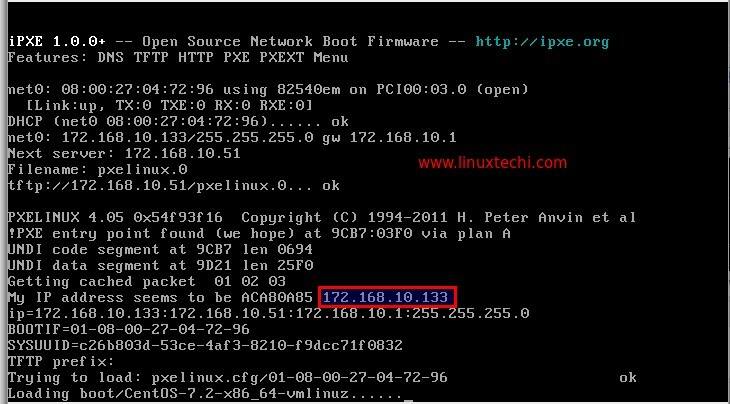 Now boot your bare metal Server or virtual machine via PXE, as we can see that server has picked the IP address from foreman DHCP server. Whole installation will be performed in text mode. This is an awesome article, please contiue to provide more articles into more advance configurations if at all possible. The foreman community and those newcomers to this type of implementations greatly appreciate your contributions. Which version of Katello do you use in the article? I didn’t realise that you installed Foreman without the Katello plugin. That’s my bad really, thank you for the answer. I too started exploring foreman and installed foreman 1.13 and provisioned setup in aws. Now i got a good article from you on server creation on bare metal.Thank you for your article.Please provide with our gmail id so for any queries , will contact you. I installed Katello base on your instruction, it works like a charm in no time. Thank you so much & very much appreciated your contribution. hi, i am following your guide but facing a problem that how to ” download the required puppet package and its dependencies under the folder “/var/ftp/pub/puppet_rpms/” because i dont know which file to be download for repository and dependencies, please send me the exact link of those file. Then use yumdownloader command to download puppet and its dependencies in a specific folder. Below is the url for reference. 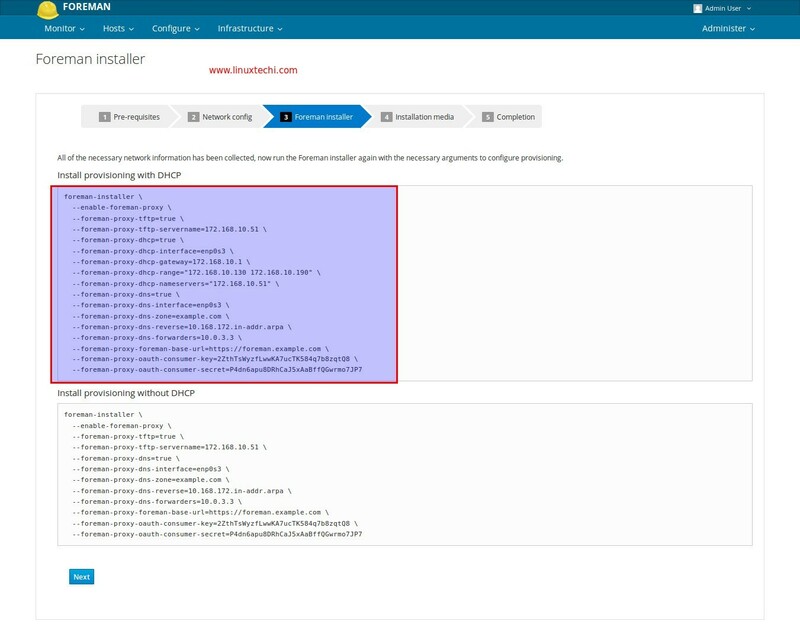 and Then use “yumdownloader puppetlabs-release –destdir /home/ftp/puppet –resolve” command to download puppet and its dependencies in a specific folder. At this time only one file was created and i put that file in my ftp server , but it didn’t worked , so i treid another command “yumdownloader puppet –destdir /home/ftp/puppet –resolve” command to download puppet and its dependencies ,At this time it created 10-15 files , again i treid to with all this file but again during provisioning the host says repository for puppet not available. In kickstart default provisioning template i am using the line repo –name=”puppet-pkg” –baseurl=ftp://myip/ftp/puppet. and why im not run in ipxe mode? I do all like you, but have error on “Instalation Source” and i don’t know why. I try 4 times all steps and all the time same result. I use content from CentOS-7-x86_64-Minimal-1611.iso this is can be a problem because minimal version? Nice Article.!! Really clear information. R u using the VMWARE workstation? or ESIX or Vecenter? Step 1 : I have installed workstation in my window machine and In one VM, installing the centos and foreman on top of it. Step 2 : And another VM is VCENTER/ESXI server as compute resource . 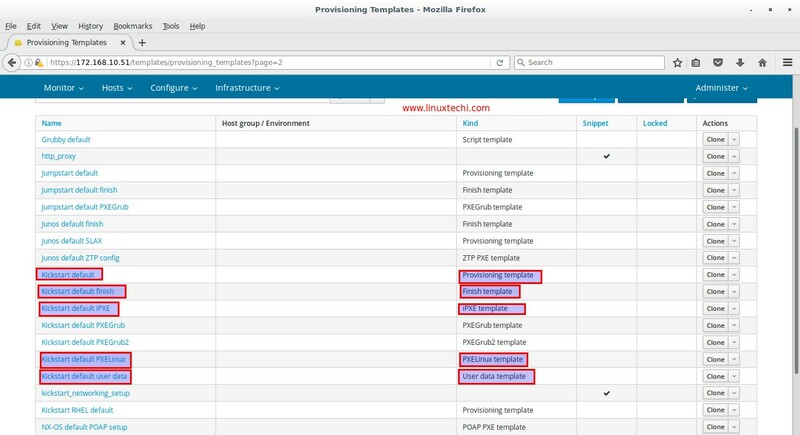 Step 5 : Follow the steps of provisioning templates and all related stuff. VM-FOREMAN will contact COMPUTE VM PROVISON NEW VM on IT. I have tested these steps on VirtualBox VMs and Bare metal Severs as well. First of all your Forman VM and target VM should be on the same vlan. 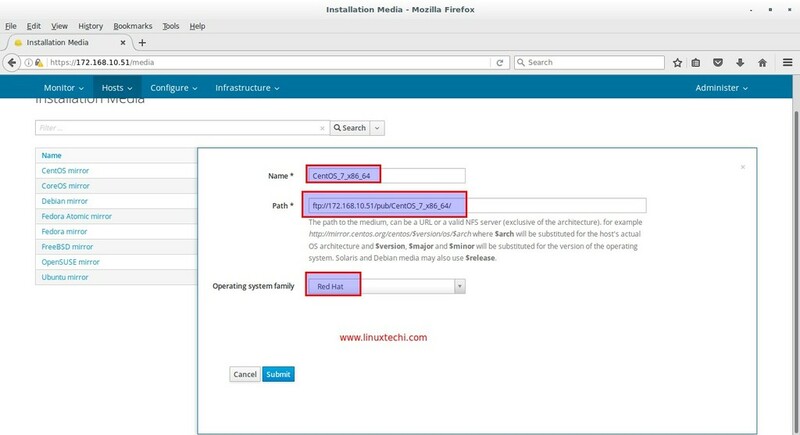 My recommended way is to setup DHCP, DNS and TFTP service on Foreman(Steps are there in article), Create your installation media and update the provisioning templates and define your target vm in dashboard and then start your VM with pxe. Thanks for your response. I got it. Can you please also mention Step:3 Configure Provisioning Setup.. I gave my foreman IP address in network address ( in your case 172.168.10.0.). is that correct? 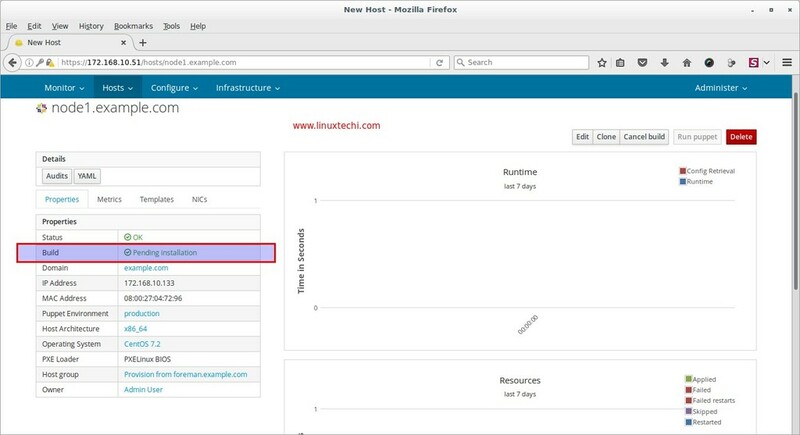 is it the foreman server ip address or VMWARE cluster ip adress? I am getting the following an error when i try to provision a VM in VMWARE. I think its may be because of newotking interfaces issue. It is not the Foreman or cluster IP, It is a Network address on which your DHCP server will start and will start assigning IP address to its clients from this network address only, In the network address we have specify the range of IP that can be used from this network address. From this range only Clients will get IP via DHCP. I dont have dhcp server in my environment. 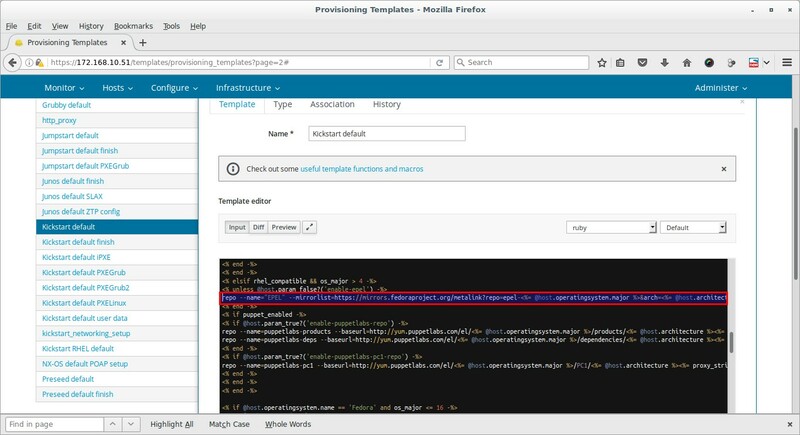 So I have given my own IP and defined my own template with user data and cloud init ( image based provision without ssh and I have one template template in vsphere. I gave the path of the location. So VM got created and i can login to VM also. 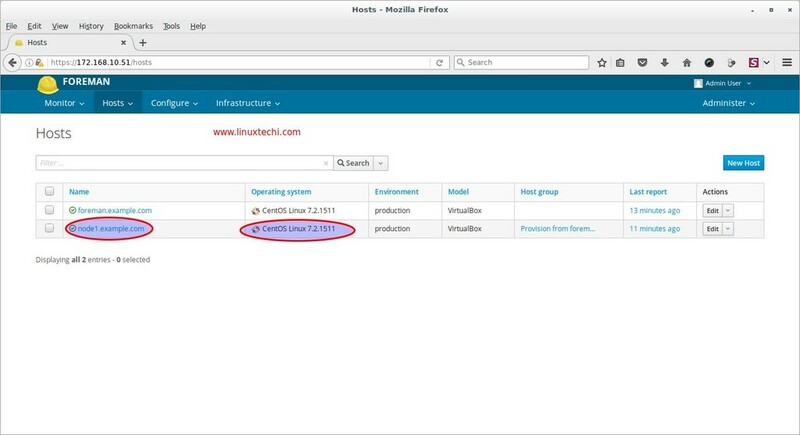 Question 1 : But in foreman still the status of the host is “Pending for installation” not sure why its not showing that installation got completed. Question 2. In your case you ahve 5 templates are there. My question is where is the Centos ISO is location? will it be on foreman machine or Vsphere? or Its template will take care of the ISO part or will it downloaded and installed from internet? Question 3 : Also I ahve given the in host creation process as 136.123.24.123 but after VM created with ip 136.123.24.123 not sure why it got changed . Please help me on this. Small correction in Question 3 : Also I have given the IP in host creation process as 136.123.24.123 but after VM created with ip 136.123.24.12 not sure why it got changed . Please help me on this. Nice article. Sir how to install Openstack Newton using FOREMAN . Followed all steps, in /var/log/messages it appears that DHCP process is complete. However my machine is never installed with OS on PXE. Apr 18 21:53:23 foreman dhcpd: none: host unknown. Apr 18 21:53:25 foreman dhcpd: Dynamic and static leases present for 10.100.112.68. Apr 18 21:54:22 foreman dhcpd: Dynamic and static leases present for 10.100.112.68. Awesome article ! In Foreman 1.16.1 with Katello 3.5. I am not seeing any Provisioning Setup Tab in Infrastructure. Is that changed now in new version. Do you have any article for newer version. I have the same inconvenience. My lab setup (foreman 1.20) has two NICs, one of them is for NAT so I can download packages, and the last one is for local network. So far I can not configure provisioning over PXE. Some help I’ll appreciate. 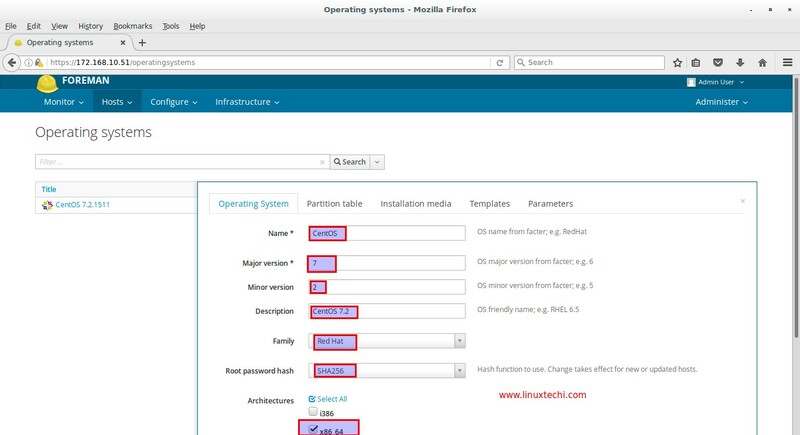 Install foreman using this command “sudo foreman-installer –enable-foreman-plugin-setup”. Apparently you need the plugin setup to have the provision setup tab.